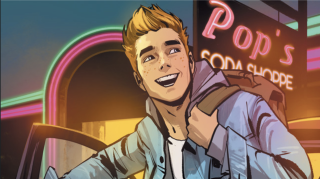 Spotify has launched a new six-part motion comic series with Archie Comics called Spotlight Archie – The New Riverdale. Based on the bestselling 2015 Archie comic book by writer Mark Waid and artists Fiona Staples, Annie Wu, and Veronica Fish, the new series sees Archie Comics continue to experiment with bringing its beloved characters into the modern age and delivering them to a younger audience. The launch of Spotlight Archie – The New Riverdale follows the success of the 2016 CW series Riverdale, which stars K.J. Apa and Cole Sprouse in an angsty re-working of the cheery original comic books. Motion comics first became popular in the 1960s, when Marvel Comics Animation used the technique to bring its characters to life in The Marvel Superheroes. They’re created by enlarging individual comic strip panels, and adding voice acting, music, sound effects, and basic animation. The launch follows the cancellation of Spotify’s original shows programme in 2017, and could signal the rise of a new market for the streaming platform. In any case, the launch of a streamable motion comic series has interesting implications not only for rival streaming companies, but also for the comic book industry and the music industry. Could this signal a new partnership between artists and comic book franchises? Only time will tell. For now, the first episode of Spotlight Archie – The New Riverdale is available to stream over at Spotify now.